One of the most annoying things on the web for many Internet users is autoplaying content and here in particular autoplaying content with sound. While autoplay is expected in some situations, for instance when you click on a video link, it sometimes comes in unexpected forms, for instance as video ads with autoplay sound or unrelated videos on pages with articles that you are interested in. Browser makers have started to do something about autoplaying content; Microsoft's Edge web browser includes an option to disable media autoplay in the next feature release later this year, and Google Chrome supports automatic autoplay blocking as of Chrome 66. You may consult our guides on controlling audio and video autoplay in Chrome, and using the audio mute functionality of the browser. Mozilla added HTML5 video autoplay blocking to Firefox in 2015. Firefox users who run the Nightly version of the web browser get access to a new feature to control sound autoplay in the Firefox browser as of today. You need to make sure that Firefox Nightly is up to date. Select Menu > Help > About Nightly to make sure that this is the case. Load about:preferences#privacy in the browser's address bar afterward and scroll down to the permissions section on the page to configure the new option. Activate the menu next to "for websites that autoplay sound" and select one of the available options. The default is set to "always ask" and you may switch the preference to "always" or "block autoplay". If you select the block option, any video with sound that would autoplay on any website gets blocked. A quick test confirmed that this works on YouTube and other video streaming websites. Firefox displays a play button in the video area that you need to interact with to start playback. The browser comes with options to add exceptions. If you want your favorite music site to always play music or your favorite video site to play videos, you can add their URLs to the list of exceptions to make sure that this is the case. The autoplay sound blocking option landed in Firefox 63 Nightly. It will make it into Firefox 63 Stable at the earliest but that depends on bug reports and issues that may come up. Now You: Do you block media autoplay? 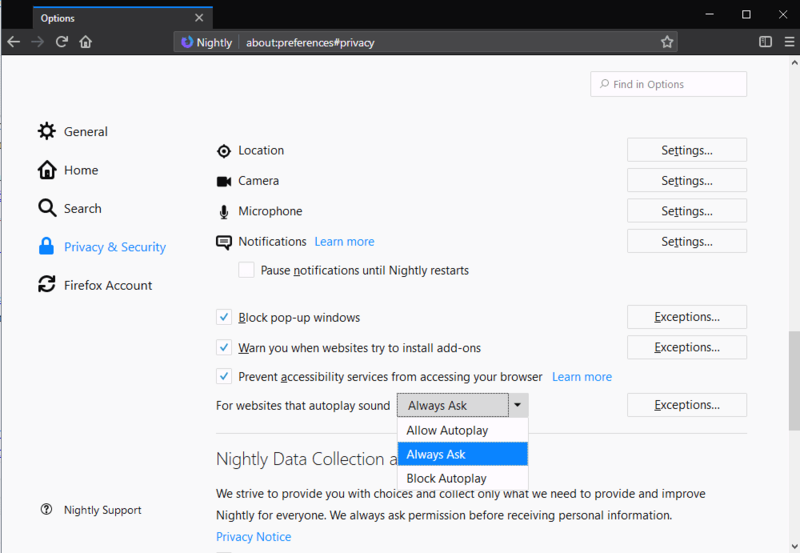 Mozilla Firefox 63 gets an option to control autoplay sound in the web browser; options include blocking any autoplay with sound or allowing it. Very useful, that’s great ! WTF MOZILLA??!! This isn’t Windows 10!! WTF MOZULIYA??!!! YOUR’S is a Nightly … stup*d! Every day, Mozilla developers write code that is merged into a common code repository (mozilla-central) and every day that code is compiled so as to create a pre-release version of Firefox based on this code for testing purposes, this is what we call a Nightly build. The update is downloaded in the background, when this is done, there is a small green badge that appears on the hamburger menu which indicates that if your restart your Nightly, an update will be applied. If you don’t apply this update within 12 hours, a dialog box will pop up asking you to do so. If you want this dialog to show up later than 12h, in about:config change the “app.update.promptWaitTime” value from 43200 to a higher value, 86400 for 24 hours for example. Sometimes, we will issue more than two updates per day, typically this is because we found out we introduced a major regression (a spike in crashes for example) and we don’t want our users to have a broken browser for 24h. No need for a” WTF”, updates can still be disabled, only the way to disable these has been changed. But disabling browser updates, this really deserves a “WTF”. Security should not be optional for a browser. And add-on compatiblity can’t be a reason for disabling updates since Firefox Quantum. Spare me with your wise remarks please. I don’t need auto update to kick in and pester me with all sorts of notifications. I can do them by myself manually too. I must admire your brave skills in literally derailing any FireFox topic. Let’s have a competition. What about this topic? I am pretty sure, every frenchman in this forum can proof, that is pure nonsens. It’s up to you now to convince this audience, it was Mozillas fault. Updates were always automatic, but could be manually turned off. Thus it can be said that Mozilla reduced the functionality. People have their reasons, and surprisingly not everyone conforms to the reasons of Sören Hentzschel. Lots of Firefox Users like the control they have over the software, which is slowly being taken away. Mozilla is losing power users by the millions. > Thus it can be said that Mozilla reduced the functionality. Nope, this can’t be said because it’s still possible in Firefox 63 and higher. As I already said: only the way to do this has changed. There is no reduced functionality at all. > Lots of Firefox Users like the control they have over the software, which is slowly being taken away. Since it’s still possible how exactly the control over the software is being taken away? Desktop market share is at all time low in relative terms, and the mobile market is lost. The decline of Add-On users in the Add-On usage statistics shows that the trend continues in 2018. Users are not happy with Firefox. @Sören: Putting the options out of the UI is a pretty big change. This is about UX design and user behavior. If you take something out of the UI it disappears for 99% of the user base. The other 1% will need to invest time to research how to get the old behavior. Mozilla also took the detailed Cookie control out of the options. These things matter to lots of people. @Calling a Heron a Crow: The option will probably come to regular Firefox eventually. It is legitimate to critize changes, that’s what the community is for, it is valuable feedback. @Pants: There is a significant part of the power user base that is leaving Firefox. When Firefox just wants to be a Chrome copy, they will lose their user base in the next years. There’s a reason Mozilla isn’t publishing the changes in absolute user numbers for Quantum, I am pretty sure it’s a disaster. If that’s not a valid reason to avoid updating, then the only option left would be to avoid using Firefox entirely. > If that’s not a valid reason to avoid updating, then the only option left would be to avoid using Firefox entirely. Why should someone disable browser updates because of add-ons if there are only new APIs for more and better add-ons with newer versions of Firefox and *no* incompatibilites? As everyone should know, this is one of the biggest advantages of WebExtensions that add-on incompatibilites are an exception and the situation is a different compared to Pre-Quantum. Because the new API is inferior, and there are many useful add-ons that cannot be implemented in it. That may change in the future, of course (although Mozilla says that for a number of things, it won’t), but it is the case right now. Cornelis, the problem with this is that the “About Firefox” windows still does an update check every time is opened. Once that checks and finds an update I get a constant badge in the menu to update. “app.update.url” does not seem to do anything regardless of its value in this case. So what I’ve done to stop it from checking for updates is redirect “aus5.mozilla.org” to localhost. Now Firefox always reports as if it’s up to date. Far from ideal but better than multiple update windows stacked on top of each other and taskbar orange flashing buttons. If you don’t get the idea why and what Nightly Builds are for, PLEASE DO NOT INSTALL Firefox Nightly and complain that it updates twice a day! Stick to the Release channel. BTW, the option “Not to search for Updates” has never been in FF Nightly! This is a very recent change. The about:config pref “browser.search.update.interval” has nothing to do with Firefox checking for browser version updates. Instead, this pref specifies the time interval (in hours) between update checks for the browser’s installed SEARCH PLUGINS. The above pref requires that “browser.search.update = true” — ie. automatic update checks for the browser’s SEARCH PLUGINS is enabled. If this pref is set to false, it doesn’t matter what value is set for “browser.search.update.interval”, because you already told Firefox not to automatically check for SEARCH PLUGINS updates. WTF YULIYA! You have a Firefox Nightly! Nightly gets an update twice a day (or night, depending on your timezone) at 10:00 and 22:00 UTC to create a pre-release version of Firefox for testing purposes. It’s utterly nonsense to skip any of these updates, so it doesn’t make any sense to disable auto updates. Sheesh, talk about an over-reaction. First of all, this is not forcing updates, it is only the update check. In nightly, they are testing how annoying the prompts become. @Cornelis – I don’t think its every 15 days default IMO, at least on my browser (I haven’t applied the latest dot release) it prompts me every few hours. There’s something else going on, but I can’t be bothered digging into the exact settings/causes. But I am sure it can be done – I may add instructions on how to do it properly when 63 hits stable. Consider that Opera auto updates, and chrome does as well (by default and they’re A-holes with their windows task scheduling etc). Other browsers I’m not sure. So FF is not FORCING an update, just reminding you, and the timing of reminders is still being tweaked. Consider also that as a DEFAULT, this is a good policy (I do not run installed FF, only portable, so I am not sure if the actual default for installed versions is to auto-update) – it’s important that end users have up-to-date software. For the small percentage of users such as yourself, then you can easily bypass it. You can still set a Enterprise policy (you don’t need to be on ESR to do this). “power users” will not be upset by this, just those that don’t understand the reasons why it was done, and that it really makes no difference. The change is only for Nightly. It’s a browser intended for testing so there’s no reason to disable updates. If you want to completely disable updates use the normal version. One thing I particularly hate is YouTube auto playing videos. I had to install a Chrome extension that paused the video on each page load. And it still doesn’t work perfectly as you can sometimes see the video auto playing and only a second later the feature to pause the video kicking in… Really annoying. This feature on Firefox is nice, but it should extend to entirely blocking any content that tries to play automatically. Also the fact that most such content nowadays uses HTML5 first and Flash only as a fallback, it should be easier to achieve. @Weilan: regarding your YouTube autoplay issue, there is a perfect add-on for that called Iridium, it’s specifically for YouTube – Martin recently discussed it. It has lots of options, one of which is to stop video to autoplay. There is a also a script version in case you don’t want an extension. I use the script version and it works fine. Neato, I gotta check it out. A company does a stupid thing, all people who have nothing to do with its bad decision but at the contrary trying to help are punished. “Due to the degrading direction AMO has taken”, I will never install your add-on. I don’t blame the developer or developers, the review sections are an absolute jungle since the mozilla team stopped controlling them – probably don’t have enough people for that. I actually found myself no longer reading the reviews whenever I install an add-on because of it, why are there lots of one star reviews with nothing written at all from lots of Anonymous-###? He could still care for the legitimate reviews, but I don’t blame him for his decision. in about:config’s search and press enter on it to make it false. Can this be configured on a per-site basis? THAT would be very useful. You can add exceptions, so yes, this should work. Thanks Martin. That’s certainly better than nothing. Per-site configurability would be ideal, but an exception list is a good start. but compared to Opera or Chrome itself, FF needs 9.76 Secs to load a page which the other two do in 2-3 Secs??? I for one would be curious to see some examples. Do you have any URLs? I’m guessing that you do because 9.76 seconds is pretty specific. I have noticed that sometimes cached elements in Firefox expire immediately but they don’t in Chrome. I haven’t looked to see if they are getting different headers or what the deal is. For uncached pages I’m seeing differences in page load times that are measured in milliseconds. Opera and Chrome are fine, only FF had Dom loadingtime to 9 secs, do NOT know why! Sorry, I have no idea what your browser configurations look like but on my end Firefox loaded the dailymail.co.uk faster and I then went ahead and looked at the BBC home page and Chrome was faster. In both cases the difference was less than a second and that’s generally what I see when looking at page load times. Firefox will be faster on one site and Chrome on another with the difference most often measured in tenths of a second. At least that’s what I’m seeing. Also, the Daily Mail had a bunch of errors and warnings in both FF and Chrome, someone needs to work on their optimization. I just looked at the DailyMail using Chrome Dev and my 2nd Firefox profile that has mostly default settings and the results are the same. The new UI in Chrome Dev is… a mess! UI Layout for the browser’s top chrome and change it there back to normal, restart, done. I’ve always typed the two letters md into the search box to see the UI related flags. Uuups, i found the mistake in my FF. The network settings were on use System Proxy, so i changed to No Proxy, FF behaves as expected again. Mea Culpa. Excellent, I’m glad you figured it out! Totaly loving this new possibility. It would be even more awesome (and effective) twist when there will be created a new function with the possibility where you yourself can program the hight of the volume standard after you turn the sound back on. This so you never going from no sound at all to mostly an unpleasant level of sound volume. about:config -> media.autoplay.enabled-> von “true” auf “false” ändern. I had tried “app.update.enabled” in Nightly earlier and still got the evening update. That was just a one day test on my part to see if it would work, I actually want Nightly to update. For complete control of audio and video autoplay. Requires a non-Gimped version of Firefox a.k.a. waterfox. Yes, always and forever. More than that, I block the media itself as a side effect to not allowing scripts to run without my express permission.